On Thursday, February 3, Mayor Jones delivered his second State of the City Address to hundreds at Jackson Ward's Hippodrome Theater. Address highlights included the development of an outcomes-based budget for the upcoming fiscal years, improving the city's aging infrastructure, continuing work to revitalize neighborhoods, reducing poverty, and a new emphasis on tourism. Click here to read the Mayor's speech. 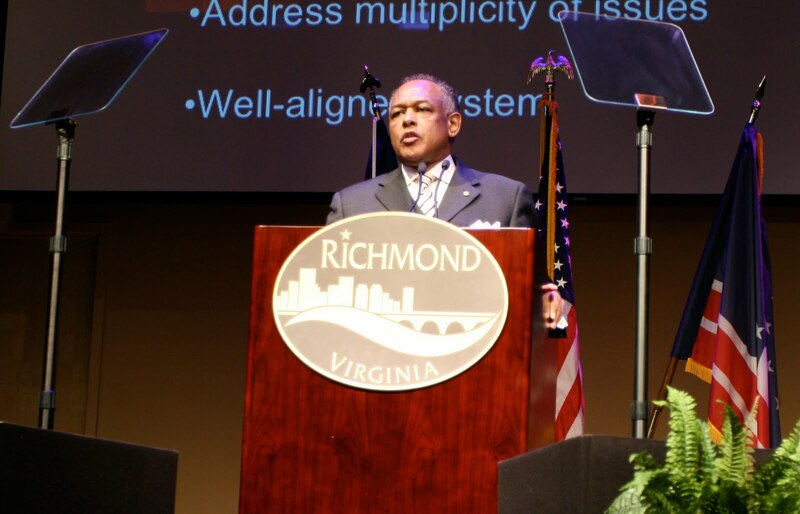 Click here to watch the video of the State of the City Address. Mayor Dwight C. Jones and City Councilman Charles R. Samuels today announced their joint proposed ordinance to manage the location of private liquor stores, should the State move to privatize ABC stores in the future. The purpose of the ordinance is to distinguish “retail sales of liquor” from other retail stores, to require a conditional use permit in certain districts, and to establish specific conditions to the operation of such stores. The conditional use process is specifically designed to promote neighborhood review and input, through the conduct of public hearings by the Planning Commission and City Council. The proposed ordinance would have a three-part approach: 1) defining “retail sales of liquor” to distinguish it from other retail stores, and distinguishing it from the sales of other alcoholic beverages (such as beer and wine, which are not changed from their current status by this proposal); 2) specifying retail liquor sales as a use permitted only by conditional use permits in certain districts, and not allowing the sales in residential districts or the HO or B-1 districts; and 3) establishing specific minimum conditions applicable to every conditional use permit, including limiting the hours of operation, prohibiting drive-up sales, and requiring certain buffering, screening and landscaping conditions. Based on the experience and research of cities in other states, there is a link between the proliferation of liquor stores and the loss of economic and social vitality within less affluent neighborhoods. In some of these studies, a direct link was found between the number of liquor stores in neighborhoods and incidents of criminal behavior and public nuisances. Studies have also shown that liquor stores tend to be more concentrated in less affluent neighborhoods. The City has a unique opportunity to avoid many of the problems experienced in other states that permit liquor stores, but do not have effective zoning controls. The conditional use process is the most effective land use tool for managing the proper assimilation of additional liquor stores into the City. It provides a vehicle for the Mayor and City Council to review each proposed store on a case-by-case basis and to approve or disapprove the use or impose conditions above and beyond the minimum as needed to ensure that the location of a liquor store will be compatible with the surrounding community. The ordinance will be introduced at the February 14, 2011 meeting of City Council.